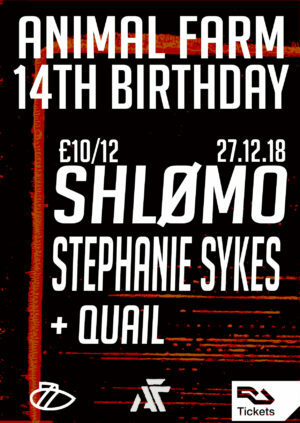 Where does the time go…Animal Farm celebrates 14 years of Techno events in Glasgow this December 27th as resident Quail is joined by two of the scene’s freshest talents making their Sub Club debut. AF are very happy to welcome longtime friend and label affiliate Stephanie Sykes to their basement home for the first time. Since debuting in Glasgow with us two years ago, Stephanie has been grafting hard between her residences in Tbilisi’s KHIDI and London’s Jaded as well as touring consistently throughout the year. Parisian DJ/Producer Shlømo has all been making waves recently in the Techno scene at large. 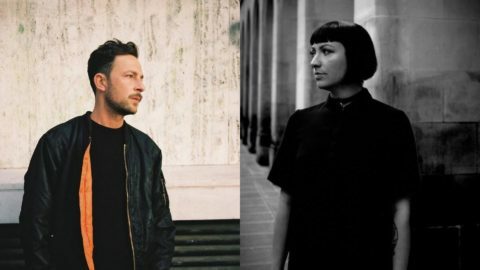 From heading up his own Taapion Records imprint, releasing originals and remixes on Glasgow’s own Soma, Delsin, ARTS and beyond; the experienced producer has carved himself a very uniquely atmospheric, emotive yet hard-hitting sound.